Fully refurbished HP Laserjet 5, please also check below for the accessories we offer for the model 5. If you have any questions feel free to Email, FAX or Call us. We also offer REPAIR service on this model of printer, if you wish to have your printer Repaired please Go Here. Replacing the LJ 4 and 4+ workhorses this printer deliveres the reliablity you expect for a small office printer. Will handle many of todays more complex printing jobs without a problem, even webpage printing. If you have a series II or III laserjet and you have been waiting on complex jobs to print, the laserjet 5 is the perfect upgrade. 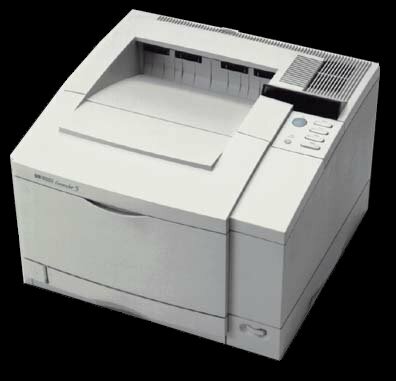 Very similar to the laserjet 4+ but with a faster CPU, which means shorter times until the first page is printed especially with graphics. With a 35,000 page duty cycle this printer is a strong upgrade over the 20,000 pages per month the LJ 4 and 4+ are rated for. Comes standard with Dual Input, 250 Sheet Cassette (Letter Size) and 100 Sheet Multi-Purpose Cassette.